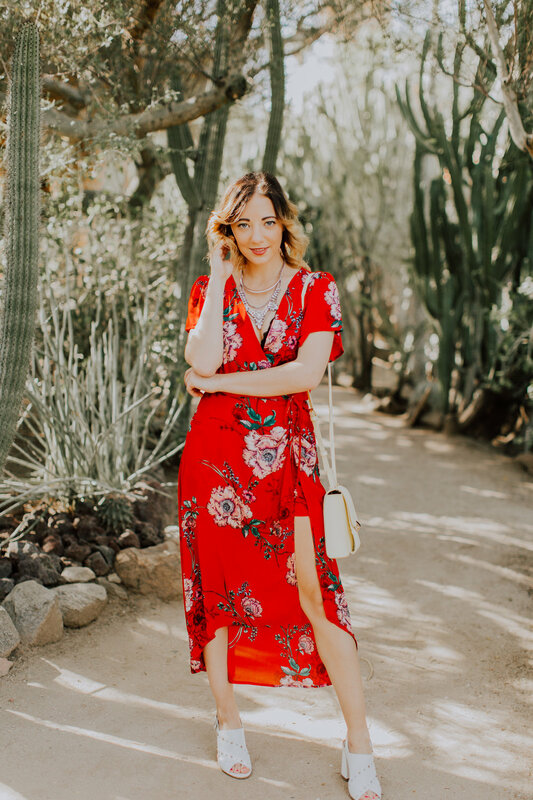 In the spirit of all you Coachella-goers, I'm sharing my favorite way to rock a bold print from my most-recent trip to the desert and yes, it's a spring (and all around) favorite of mine. I'm talking florals. 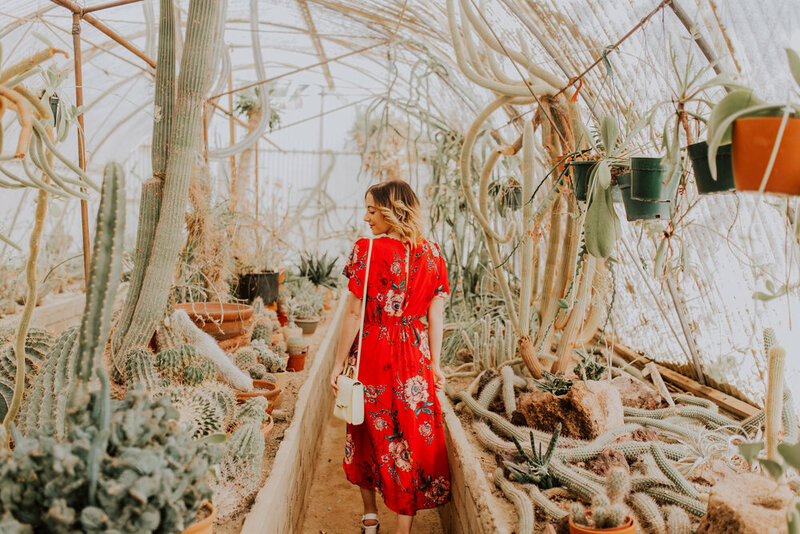 It's really no surprise florals are a hot commodity in the spring and summer months, especially here in Seattle where we crave the sunshine and vibrant blooms constantly in the midst of all the grey. The low v-cut neckline is also flattering and one that allows you to show off your favorite jewelry or a cute bralette. I vouched for a black bralette and a silver festival-inspired statement necklace that contrasted nicely against the bold color and pattern. Speaking of color, I can't seem to get enough of the color red lately. It's a color I avoided for years, and now I'm finally embracing it in my wardrobe. The dress hits above the ankle so any type of shoes will work for shorties like me. I'm wearing my white Topshop block heels (currently on sale here) but for all you desert dwellers, you might opt for a pair of sandals. My yellow crossbody from Target introduces another pop of color that's complementary to my bold red dress. It's also less than $20! It's the perfect handbag for holding the "need to have" essentials. When you're on the go, you don't want to lug around a bulky handbag. 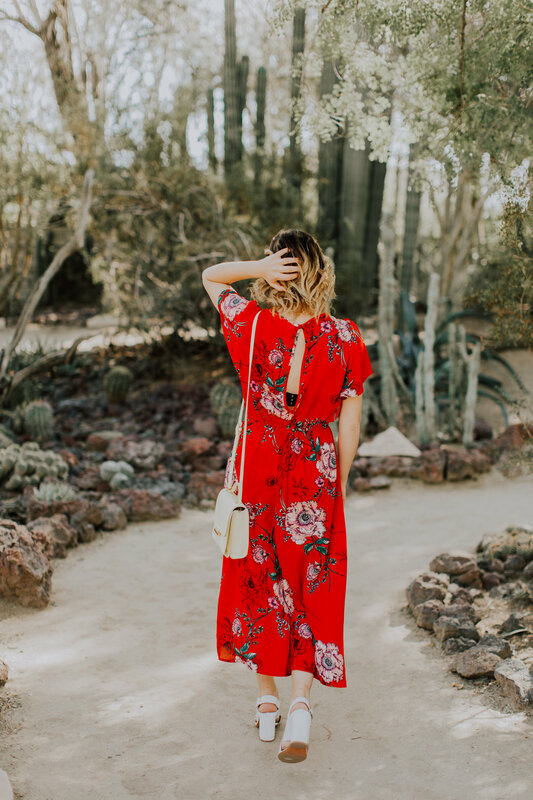 Whether you are desert dwelling in the upcoming weeks or seeking out ways to brighten up your wardrobe with a trendy print, I hope this outfit inspires you to embrace your bold!